On the way from Bangalore to Mysore, a two-hour detour can yield a rich harvest of sightseeing. On the Bangalore-Mysore SH 17 state highway, less than a kilometer after exiting the town of Mandya, there is a road that leads to the temple town of Melkote. After you have completed your darshan of the two main temples in Melkote, the Cheluvarayaswamy Temple and the Yoga-Narasimha Swamy Temple, you can take the road down towards Srirangapatna, pass through the small town of Pandavapura, and rejoin the Bangalore-Mysore highway near Srirangapatna. Pandavapura, as the name suggests, has a connection with the Mahabharata epic. Legend says the five Pandava brothers, along with their mother Kunti, had stayed at this place for some time after their escape from the house of Lac at Varnavata. Wikipedia mentions the word "exile", but that cannot be quite right, because Queen Kunti had not accompanied the the Pandava brothers on their 13 year exile. The only time when the Pandava brothers and their mother Kunti spent any time in the jungle was after the Varnavata episode. Kunti liked this place, and it came to be known as Pandavapura. Today, the town is mostly an agricultural town, and the surrounding fields are used to grow paddy (rice) and sugarcane. Mile after mile of roads are dotted on both sides by paddy fields or sugarcane plantations. The district headquarter and town of Mandya is also known for being the sugar capital of the state of Karnataka. 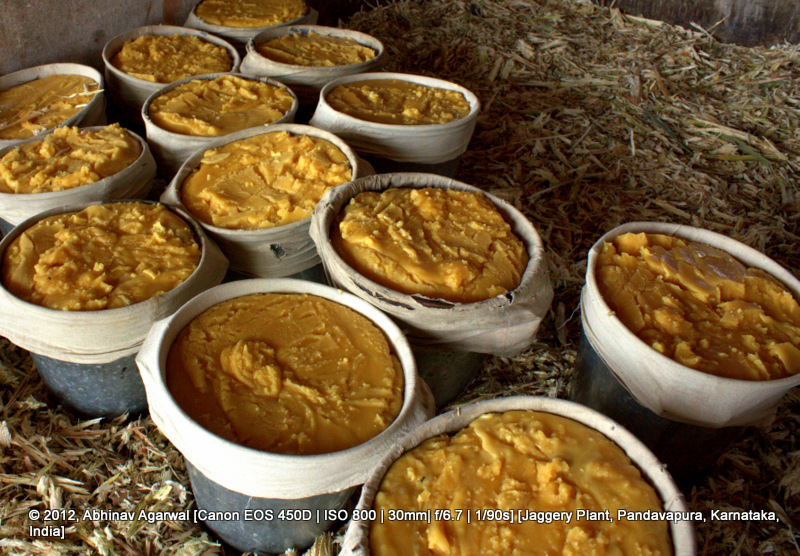 The other claim to fame that the town has are its jaggery ('gur' गुड़) manufacturing units. These are are typically small-scale units that are run by a handful of people, and can be found dotting the roads. The tell-tale sign of such a unit is the dark yellow smoke billowing from its chimney. We took a chance and stopped by the first such unit we saw. Not sure whether they would allow or welcome uninvited guests, we nonetheless parked our car and ventured inside. The unit, and to use the word manufacturing plant seems overly over-ambitious in this context, is basically no more than a few rooms with a tin roof. Crushed sugarcane stalks are littered all over the place, laid out to dry. These have a use, as we will see shortly. At one end of the unit is a single contraption that is used to crush the sugarcane stalks. The juice flows through a channel and into the vats used for the actual jaggery making. 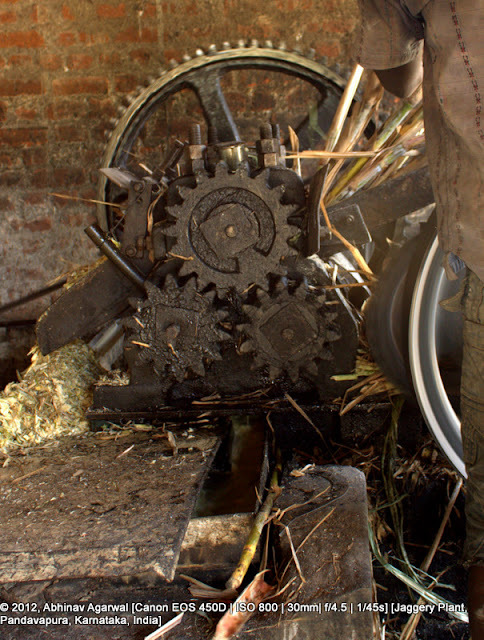 The sugarcane juice is brought to the first of the three vats shown below. The juice is collected in the vat on the left. From there it is filtered and passed to the second vat. Here it is boiled. How long I don't know, but boiled it is. After the appropriate duration of time, that the juice needs to be boiled for, it is then passed to the third vat. Here some more boiling takes place. In this third vat, the final one, some color additives are also added, to give the jaggery its distinctive yellow color. Boiled sugarcane juice tends to be more white than yellow, while jaggery is yellow in color. The color is the result of these additives. After the juice has been boiled and is thick enough, and it is really jaggery at this point, it is poured out of the third vat and into the flat and shallow receptacle. See the closeup of the channel through which the molten jaggery flows. As you can see below, the pan into which the molten jaggery flows is quite broad and shallow. This is to get the jaggery to cool down fast. No air-conditioning or air-blowers here. 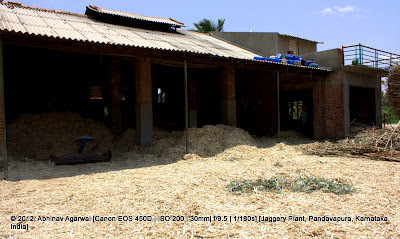 Just good old physics here - large surface area means accelerated cooling down of the jaggery. At this point the jaggery is quite gooey. Yes, that's the exact word that came to my mind. After some time, perhaps as little as 15 minutes to half-an-hour, the jaggery has cooled down sufficiently and is now in what I would describe as a semi-solid state. Shovels are used to scrape the jaggery off the pan and pour it into small buckets. Each bucket can hold about 10kgs of jaggery. The thin cotton cloth that lines the buckets ensures that it is easy to take out the jaggery from the buckets. The pails otherwise would become one sticky mess with bits and pieces of jaggery sticking to different corners and crevices. Since the jaggery is now cooling down at a fast rate, several pails are lined up and three or more people can be seen at work simultaneously, grabbing pails and scraping and pouring the jaggery into the pails. This particular photo should give you an idea as to how fluid the jaggery is even at this point. Of course, you can also taste some if you so want. And it is the one of the most heavenly tasting jaggery I had ever eaten. It would be incorrect to say it melted in my mouth since it was already in a semi-solid state, but if it could have, it would have. Here is all the jaggery from one lot, collected and poured into pails, and ready to be sealed and sent to wholesalers and retailers, who then take it out of these pails and break them into cubes or pieces to package and sell. Remember the crushed sugarcane stalks I was talking about earlier in the post. And promising to talk about them later on? Well, it turns out that the furnace underneath the big, giant vats of sugarcane juice are fed with these sugarcane stalks. Neat, smart, green, eh? Gobsmacked, to use a miserable phrase I detest. Who feeds these crushed stalks into the furnace? A machine? No. A channel, a sluice of sorts? No. The distinguished gentleman at the bottom is the one who makes sure the furnace is kept fed with crushed sugarcane stalks. He sits near the opening. All day long. He has a stick in his hand that he uses to push the stalk through the opening. All day long. He does that for as long as the furnace needs to be burning. All day long. His is an exciting job. All day long. As my brother said, "his eyes are dead." And yes, I had to include this photo as a parting shot. The gentlemen at work in this jaggery unit wear slippers. 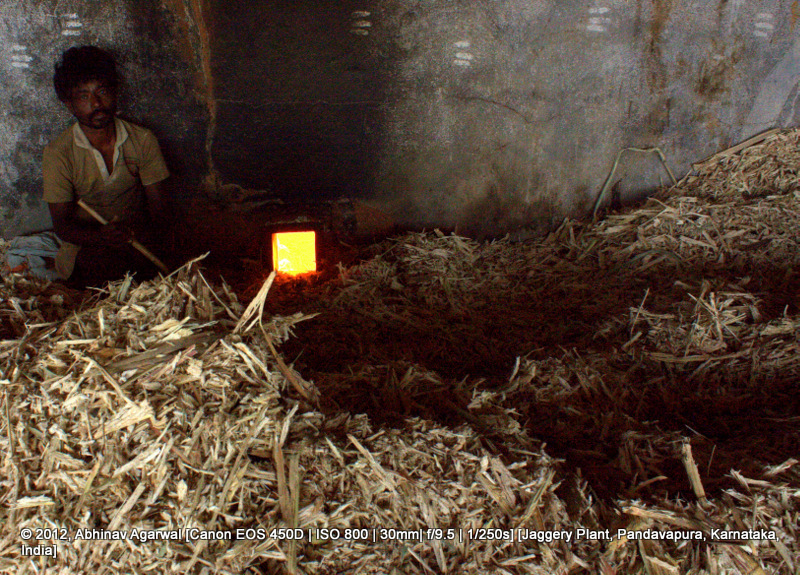 Barefoot would be cruel since the floor and the jaggery can be very hot and scald the skin. I leave it to your imagination to work out the details of the flavors that mingle with your jaggery. A sort of a geographic indicator into the origin of each chunk of jaggery I should say.